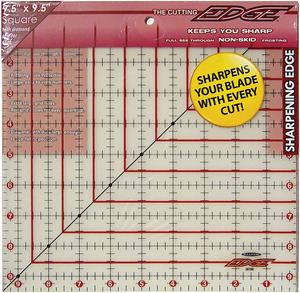 Diamond Carbide edge, keeps your rotary cutter blade sharpened as you work, A unique patented sharpening edge that will help keep your rotary cutter blade sharpened as you work! It is the same concept as a knife sharpener, each time you take a cut on the sharpener side you will run along the 650 grit Diamond Carbide edge. This keeps your rotary blade fine tuned and lasting longer!